Since Ulrich Beck’s seminal work, Risk Society (1992), sociological inquiry has connected‘risk’ and ‘risk consciousness’ with discussions of anxiety. Social theorist Iain Wilkinson has argued that risk has created a language for anxiety as “the more we recognize ourselves to be ‘at risk’ the more vulnerable we become towards anxiety” (Anxiety In a Risk Society 5). This dialectic between anxiety,risk, and security, then, necessarily confronts sociological analyses with “cultural narrative” (5). Fromthe recurring medieval narratives of cultural reformation, the idealization of the pastoral in the wake of industrialization, to the rise of contemporary post-apocalyptic fiction, fears of an uncertain future manifest themselves across literary history. This conference will consider how writers in different historical periods have used literary form to respond to various cultural anxieties and the ways literary texts across time and space have both recorded and shaped our perceptions of risk. 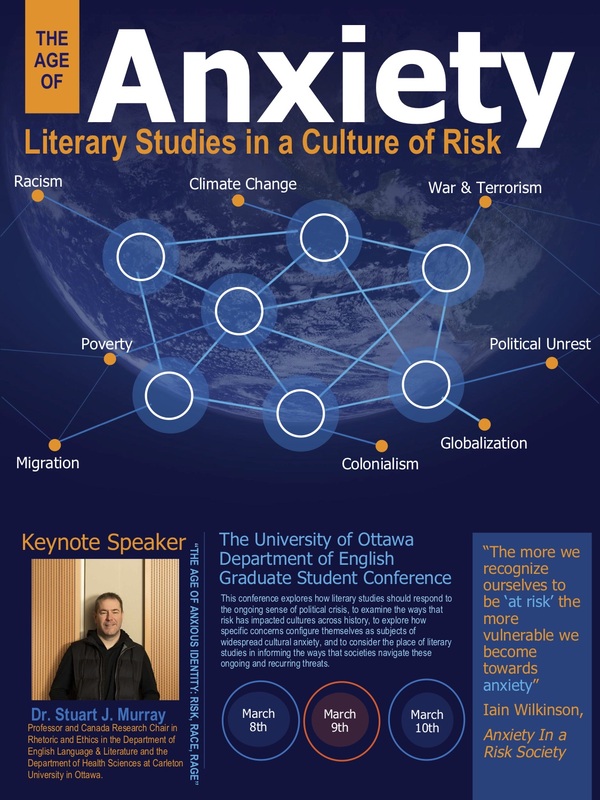 We hope to explore how literary studies should respond to the ongoing sense of political crisis, to examine the ways that risk has impacted cultures across history, to explore how specific concerns configure themselves as subjects of widespread cultural anxiety, and to consider the place of literary studies in informing the ways that societies navigate these ongoing and recurring threats. Feel free to contact our conference organizers at uottawa.conference@gmail.com if you have any questions.